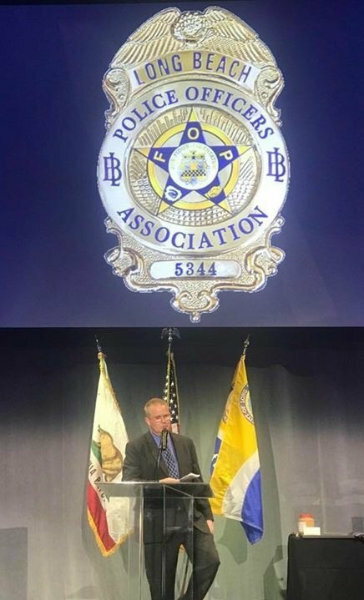 On September 21, 2017, outgoing POA President Steve James had his retirement party held at the Long Beach Convention Center. Nearly 500 guests filled the beautifully decorated Arena Pacific Ballroom where they enjoyed food, drinks, conversation, and music. As guests arrived, they were encouraged to sign a matted caricature of Steve and his family. Additionally, they were given the opportunity to inspect his beautifully decorated shadow box. Please click here to see a video tribute. The festivities began with a special performance by LBPD’s own “Bilvis.” Corporal Billy Foster was in full Elvis attire and sang several songs for the audience, including a couple that had special lyrics written just for Steve and his family. As usual, “Bilvis” brought the house down and lifted everyone’ spirits. Please click here to see the YouTube video. Towards the end of the ceremony, retired Sergeant Buzz Williams brought the crowd to laughter with compromising photos of Steve when he was a younger officer performing skits for retired officers at the “Sub-Station North’ gathering. Steve’s former partner Ron Burgess also informed the audience of comical stories from when he and Steve worked patrol together. Jim Foster spoke on behalf of the POA Board of Directors. He advised the crowd that the POA award presented to the top recruit of every graduating class would name be named after Steve. He then informed Steve that the Board had also voted to rename the POA Boardroom in his honor. Jim presented Steve with a beautiful bronze plaque that will now take permanent residence outside the boardroom doors of the office as a remembrance of his 17 years of dedicated service. Steve closed the night by choking back tears and thanking everyone for the night and for their efforts over the years. He spent several moments thanking his beautiful wife Amy for her love and support. The night was a very fitting and classy tribute to a man who has given so much of his time and effort to our association, Department, and City.